Need to vent here a little. I am getting frustrated with what I believe are incorrect answers on Pearson VUE practice exams that come with the Odom Cert guides. Hard cover and electronic versions. So I have been reading the Odom ICND1 book and studying a couple hours per night since early March. I am at the point now I am doing a practice test per night, 90 minutes 45 ? 's ICND1 material only from all of the different exams I have codes for. I'm hoping to schedule for ICND1 before 6/15/13 two nights in a row so far I have had questions in my test that I believe an answer I marked as correct was flagged as wrong. New PC's added to this LAN can use any IP address between 192.168.11.193 and 192.168.11.223 except for the 192.168.11.201 and 192.168.11.199 IP addresses. This was flagged as an incorrect answer. These Pearson IT Practice test questions are intentionally worded to trip you up to start with. So I have been taking the words written on the screen in a VERY literal sense because if I DON'T I get answers wrong. Now I run into one where if I DO they flag the answer as wrong. Let me make my case. If I were to say "look at the following letters" CDEFG and then ask you which letters are between C and G what would your answer be? I read the above with the word *between* and come up with an ip range where I *could* assign new PC's that includes .194 thru .222 (except .201 and .199 as the line also states) which would make the answer tecnically true. I see what they are trying to get across here but when they mince literal words to say you have an answer wrong they should also mince literal words to say when you have one right. I took the Pearson ICND1 twice and both times scored just below (by 1 question at least one of those times) passing. The problem wasn't that I didn't know the material, but that the questions were poorly worded or intentionally designed to mess you up. One that really annoyed me was a Port Security question that said "Select All that Apply". It claimed another answer also applied. But, the question was worded wrong. It was worded such that A (Port Security) will cause B (A Broadcast) which will cause C, which is incorrect. B (A Broadcast) will eventually happen (ARP, RIP, whatever) and will cause C, but this has absolutely no relation to A (Port Security) occuring. I went and bought the Boson ExSim-Max for ICND1 and scored a 901 on my first try. While it did have some answers that were designed to trip you up, it was much more fair (stuff that could be easily missed like a RIP command being entered in global config mode instead of poor wording). The Boson also includes Simulations and Simlets, which the Pearson tests do not. If you can spare the $89, it is a much better practice test than Pearson and from what I've read around here it is a pretty good indicator of whether or not you will be able to pass the real thing. I never used the Pearson exam prep...does it tell you the correct answer and why? Along with why the wrong answers are wrong? If not, I would look for another exam prep program that does. Usually the ones that come with the books are a little sketchy adn you are better off paying for one that gives you the why each answer is right or wrong explanation. Yes and No. On the question that annoyed me, it explained why all the answers I had chosen were correct, but gave no explanation for why the additional answer it was also saying was correct was correct. Makes me wonder if perhaps its inclusion could have simply been in error? It does try to explain things on many of the answers. Although there have been some as well that I really wanted to see the answer and the why's and there was NOTHING. Kinda strange. Almost like they though it was explained so clearly in the text book that there is no reason to give the Why's with the answer on the practice tests. Like you would be dumb to have answered this one wrong lol. With the particular Q/A I mentioned they clearly wanted you to avoid that answer because .223 is the broadcast address. I guess I should have read into it when the answer didnt say *between* .192 and .223 that they really DIDNT mean *BETWEEN* lmao. So far I have been pretty happy with the product. I like Odom's books. The Pearson practice test stuff is better than nothing. It would just piss me off to fail a real life test I paid $150 to take because an answer that is technically correct is marked as wrong. Makes me wonder 1) if this sort of stuff happens on the real tests. 2) makes me second guess myself while trying to learn some of this stuff and thats not a comfortable feeling. I'm trying to BUILD confidence not knock it down. I found those practice exams extremely frustrating as well. I tended to score around 700 on them (I found that I always checked too many things or not enough things on the multi-choice) - this caused me a huge amount of anxiety going into the actual test because I was worried it would be the same but, fortunately, it's not. The actual exam (ICND1) is fairly well written and much easier (from my experience anyway). Dude, i was just came in here to find ODOM`s email so i can complain. I did 3 question in NAT section. and 2 of them was wrong. I wish i could share the questions here to see. But i am sure they wont let us due to copyright issue. I would really like Wendell Odom to come here and share his opinion. I pad Extra $40 for premium edition ebook and It is not even right. At this point, i would really like my money back, or at least a credit or something. Because I already had the physcial book, and now i paid money for exam that makes me feel bad for the exam. WGU classes: Transferred -> AGC1, CLC1, TBP1, CJC1, BVC1, C278, CRV1, IWC1, IWT1, C246, C247, C132, C164, INC1, C277. Appealed -> WFV1 and C393. IMHO, his book is pretty good, but the Pearson practice tests that come with it are worse than worthless. I am pretty happy with Odom's books so far myself. Enough I would buy another he has authored. It is the Pearson practice test engine\tests that I am frustrated with. Funny thing is the Pearson test engine and extras helped me tip the scales toward the Odom books as opposed to something else. I figured if Pearson has included "practice testing" and Pearson does all of the actual testing for Cisco that It was the safest investment toward having a near to "real" practice testing experience. You know... the actual "REAL" test questions would have different data points but generally be laid out the same way or flavor as the Pearson "practice" test questions. Well, it appears I may have been wrong about that. The general opinion I have observed so far seems to state that the Boson ExSim is closer to the "real" thing than Pearson puts out themselves. I am so far consistently scoring in the mid 800's on my Pearson ICND1 practice tests, but am thinking of spending the extra money on the Boson package just for a second opinion on my readiness to take the ICND1. I bought the bought the Boson ExSim-Max for ICND1 and I have found this to be the most fair and correct practice test I have taken so far. Yes, The Boson ExSim-Max for ICND1 costs $$ but it's well worth the money in my opinion. While I have not yet passed the ICND 1 my test scores have gotten better with the help of this study aid. "A lot of fellows nowadays have a B.A., M.D., or Ph.D. Unfortunately, they don't have a J.O.B." Well i was very happy with the previous practice test came with the book, but that was running on Boson test engine. With the new Pearson IT engine exam questions are retard, i did one test, and found 3 wrong answer in 24 question(just in NAT). I also have Boson ICND2 exam, i was thinking to use both, but i guess just stick to boson. I was using Pearson having upgraded to the premium edition for ICND1 but won't be doing it for ICND2. I purchased the Boson exams and they are a lot closer to the real thing in terms of difficulty, phrasing and question format. thanks all, I have been scoring in the mid 800's on the pearson practice tests, but decided to buy the Boson practice tests and give those a whirl. Hoping to schedule a test in the next week or so. but want to get Boson's opinion on if I'm ready first. The more of the Pearson ICND1 practice tests I do the more I'm getting the feeling that the Pearson practice stuff is focused on a fairly small window of what is covered in Odom's ICND1 book and this scares me. I have read the book cover to cover and then reread chapters I have had trouble with and now after taking a practice exam every couple of days and doing ok 850-870 I am thumbing through the book again and seeing stuff I have nearly completely fogotton that the Pearson practice exam's dont seem to be asking me questions about. This worries me a bit and thus the decision to give the Boson Practice tests a whirl. If I purchase the Boson Exsim-Max exams for 640-802 ,will that help me also for the individual incd1 & 2 papers as well? I mean say if i buy the Exsim-Max exams for 640-802,then will that also help in preparing for the 640-822 exams? Just leaves you thinking 'WHAT!' I sincerely hope the actual exam ones aren't like that because its taken me 2 hours to do 15 questions!! EDIT: I'm also so glad others are of this opinion, I was starting to panic and get really down about this! Just searched for 'wording' and most of the results are about the pearson tests! Says a lot. The actual test - at least when I took it (640-822/816) - was not anything like the Pearson tests. I wrote this before I took the ICND1. I used Boson's practice exams for both the ICND1 (914/1000) and ICND2 (916/1000). The Boson ICND1 test was about equal to the real thing in difficulty. Their ICND2 is harder than the real thing, especially their ACL questions/simulations which were brutal. But, unlike the Pearson practice tests, the Boson questions [and those on the real exam] were intelligible and clearly worded. Hope this isn't copyright infringement but this question was almost the end of me. Does anyone else think its unreasonable? I got it wrong btw. What were the answers, A and E? Seems it's more an exercise of determining if hosts are in the correct subnet and checking for subnet overlap. If they do overlap, how does OSPF react? I believe the correct answers are B and E because PC4's Default Gateway is not on the same subnet as PC4. As is common with Pearson, OSPF is simply thrown in as a red herring. The real question is about subnetting. Sure, but what does that have to do with PC1 being able to ping R4's LAN interface? This is how I arrived at my answer for "A"
Since PC2's and PC3's networks overlap, and PC2's address falls within PC3's network, R1 will choose the "most specific route" when directing traffic. If PC2's address was outside of the overlap, lets say 10.2.22.221, then I think it should be able to ping successfully. Yes, A&E was correct. But I genuinely had no idea about this scenario, I don't think I read anything like what would OSFP do if there were overlapping subnets somewhere in the internetwork? It is A&E. I chose B too. OSPF wasn't a red herring, because it didn't say 'OSPF is configured correctly' in the question. Nailed it. And yes, that threw me off too so it was wrong but it didn't matter to the answers which was immensely frustrating. Are you guys CCNA certified? 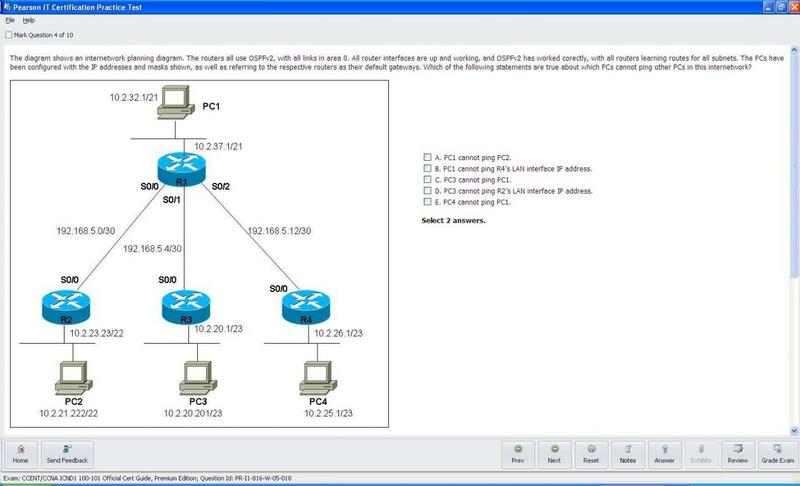 EDIT: Also, to clarify, is there are overlapping subnets, OSPF will chose what? The encompassing network? What will the LSDB state? Also are these what the questions are like in the CCENT exam? EDIT 2: Just found this in an article: When matching more than one route, the route with the longer prefix length is used. I looked at that probably half a dozen times and saw /23 [rather than /22] each time for PC2. Either way PC4 should not be able to communicate with anyone on another subnet. I assume the reason PC1 can't ping PC2 would be because [due to the overlap] PC3 has a more specific or longer-prefix route (/23 vs. /22). I would have to try it, but I suspect that PC1's GW would have both routes, but the route from PC3 would be chosen for use because it is more specific. The pings get sent to PC3's gateway who I would think should return a "Destination Host Unreachable". Why is OSPF Load Balancing between R2 and R3? These routes are not identical...Perhaps a PT issue? theoxada did you manage to get it working the way the question says it should? No. For some reason it doesn't seem to work as you would think it should in Packet Tracer. A - PC1 cannot ping PC2. I would expect PC2 and PC3 to advertise their subnets to PC1. Since PC3's has a longer prefix, I would expect it to be used, causing traffic to be unable to reach PC2. But, in PT...OSPF is simply load balancing the two routes which would mean you should have intermittent pings. B - PC1 cannot ping R4's LAN. While, it should not be able to ping PC4 due to the gateway being on a different subnet. R4's LAN interface should be pingable. C - PC3 cannot ping PC1. PC3 and PC1 should be able to communicate - see A. So, the answers should be A and E.
Further to this, I haven't been doing the section by section exam reviews and just went in for the full practice test. I scored 755/1000. I see a lot of you guys from searches too were scoring there or thereabouts and getting circa 900+ in the actual exam. Does this mean I'm ready? I scored in the 700s if I remember correctly (just below passing) on their ICND1 repeatedly, but scored 900+ on the Boson ExSim-Max and ~912 on the actual exam. For ICND2, I didn't even bother with Pearson. I used Boson exclsuively, scoring 900+ on the first practice test and the 700s on the next two. Their (Boson's) ACL sims (their tests tend to get progressively harder from 1 to 2 to 3) were just plain brutal and they got me on some little things I didn't realize (e.g. A VTP Client can update a VTP Server - definitely good information to know). When I took the real thing, I Scored ~914.